Background: Nasopharyngeal cancer is a rare cancer worldwide. It is now found to be increasing in incidence in Nigeria, though the incidence is lower when compared to countries in the Mediterranean basin, North Africa and Southeast Asia. This cancer is frequently associated with Epstein-Barr virus (EBV), but no previous study was done in this centre to document the association. Aim and Objectives: To assess the EBV status in Nigerian patients with nasopharyngeal cancer by using Latent membrane protein – 1 immunohistochemistry. ( LMP-1IHC). Materials and Methods: Thirty-five (35) out of Seventy-five (75) histologically-confirmed cases of nasopharyngeal malignancy (NPM) seen in the Department of Anatomic and Molecular Pathology of Lagos University Teaching Hospital, Lagos between January 2003 and December 2012 were available for EBV study using LMP-1 IHC. Results: EBV LMP-1 IHC was positive in thirty (86%) out of the thirty-five cases studied and these consisted of, 14 cases of undifferentiated carcinoma (WHO type 3), 5 cases of non-Hodgkin lymphoma and 2 cases of adenocarcinoma. 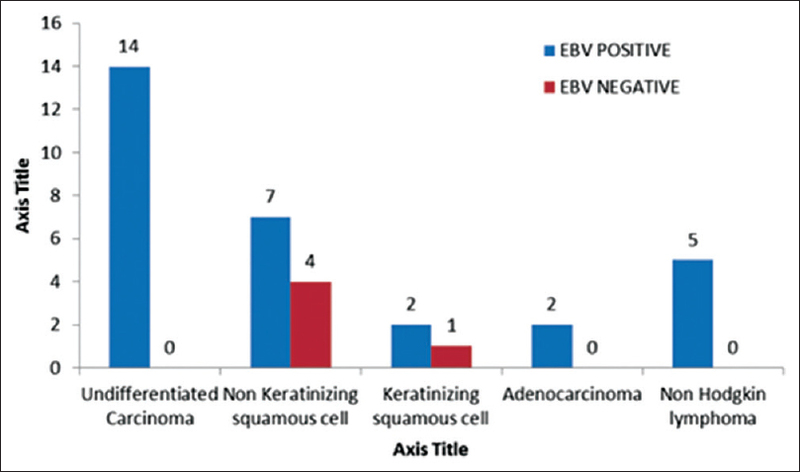 Also seven out of eleven cases of differentiated non-keratinizing squamous cell carcinoma (WHO type 2) were EBV positive and two of the three cases of keratinizing squamous cell carcinoma (WHO type 1) were EBV positive. Conclusion: This study has shown that nasopharyngeal malignancy in our centre is highly associated with EBV latency as detected by LMP-1 immunohistochemistry. Epstein–Barr virus (EBV) was first discovered by electron microscopy of cells cultured from Burkitt's lymphoma tissue by Epstein, Achong, and Barr. EBV infection is known to infect over 90% of the world population with most infection latent and subclinical. However, in virtually all cases of nasopharyngeal carcinoma (NPC) from endemic region, elevated antibody titers against EBV viral capsid antigen, IgA and early antigen, latent viral nuclear antigens 1 and 2 (EBNA-1 and EBNA-2), and neutralizing antibodies to EBV-specific DNAse in the patient serum have been documented. The elevated antibody titers tend to precede tumor development by several years and correlate well with tumor burden, remission, and recurrence. EBV DNA has also been found in the tumor tissue as well. Despite the important role played by EBV in the pathogenesis of NPC, only a small percentage of those infected develop cancer which tends to suggest that other environmental, genetic, and dietary factors are critical to eventual development of NPC. Studies in the literature show that the EBV infection in nasopharyngeal epithelial cells happen before clonal expansion of the tumor cells' population. Studies in normal nasopharyngeal tissues and on biopsies of premalignant tissues show the presence of genetic alterations at an early stage of carcinogenesis, indicating that the stable infection of EBV epithelial cells requires a changed cell environment. NPC is a malignant tumor which arises from the epithelial surface of the nasopharynx, and the World Health Organization (WHO) has classified this into three types. Type 1 is the keratinizing squamous cell carcinoma (KSCC). It is the most common type seen in the older age group and does not show high association with EBV, but it is commonly associated with human papillomavirus and cigarette smoking. 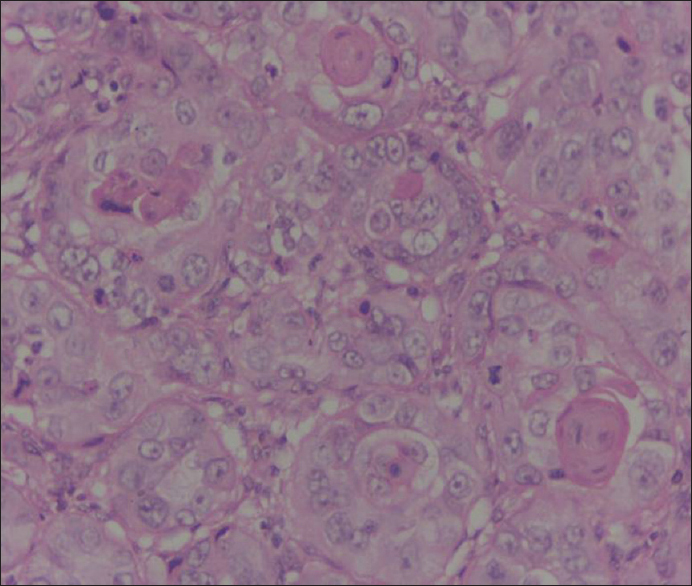 The others are Type 2, non-KSCC and Type 3, undifferentiated carcinoma. Type 2 and 3 are frequently associated with EBV and commonly found in the endemic areas. Other malignant tumors that can arise from different components of the nasopharynx are adenocarcinoma, adenoid cystic carcinoma, mucoepidermoid carcinoma, lymphoma, plasmacytoma, melanoma, and even sarcomas. EBV is a member of the herpes family and has been implicated in the pathogenesis of NPC and several other human cancers, mainly Lymphoma. EBV infects B lymphocytes and epithelial cells of the nasopharynx using complement receptor CD21 to attach to and infect the cells. Infection of B cells is latent, but the B cells latently infected with EBV are immortalized and acquire the ability to propagate indefinitely. The molecular basis of infected cells' proliferation involves two EBV genes, the first gene is latent membrane protein-1 (LMP-1), an oncogene that autonomously activates the NF-kB and JAK/STAT signaling pathways and promotes proliferation and immortalization of EBV infected cells. LMP-1 also prevents apoptosis by activating Bcl-2, an antiapoptotic protein, thus EBV uses autonomous activation of normal signaling pathway to expand the pool of latently infected cells. The other gene is the EBNA-2. This gene transactivates several host genes including cyclin D and the src family of proto-oncogenes. Reports have shown detection of EBV LMP-1 in the tissue by immunohistochemistry (IHC) but with reduced sensitivity when compared to in situ hybridization in detecting nuclear EBV-encoded RNA (EBER); however, LMP-1 immunohistochemical expression depends on the concentration of LMP-1 protein in the cytoplasm of the tumor cells. In addition, EBV genome contains a viral cytokine, vIL-10, derived from the host genome. This viral cytokine can prevent macrophages and monocytes from activating T-cells and is required for EBV-dependent transformation of B cells and epithelial cells. The aim of the study was to assess the EBV status in Nigerian patients with nasopharyngeal cancer using LMP-1 IHC. Paraffin-embedded tissue blocks of 35 histologically diagnosed cases of nasopharyngeal malignancy (NPM) seen over a period of 10 years at the Anatomic and Molecular Pathology Department of Lagos University Teaching Hospital, Lagos, between January 1, 2003 and December 31, 2012 were retrieved from the archives. Relevant information such as age, hospital number, laboratory number, and clinical detail were extracted from the departmental cancer registry and from patient's folders. Fresh sections from the tissue blocks were taken in situ ations where the original slides were not found or had been damaged. 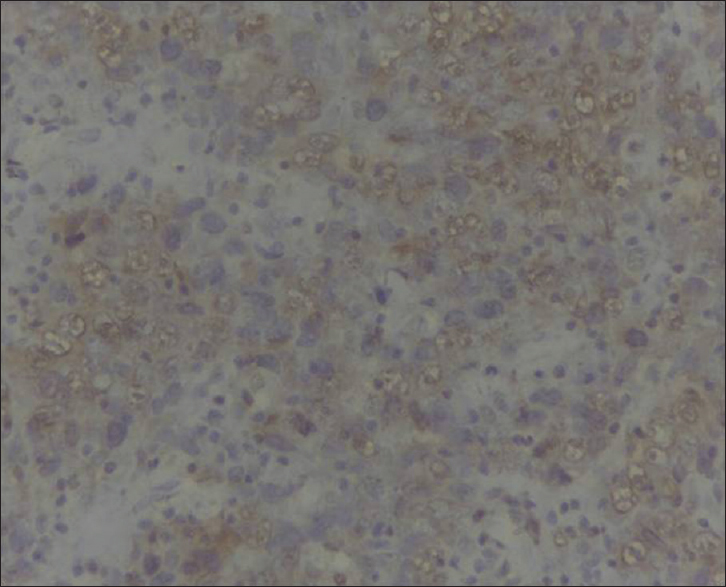 Immunohistochemical studies for EBV LMP-I were done using an anti-EBV LMP-1 antibody solution at 1/20 dilution (Santa Cruz Biotechnology, Inc., Heidelberg). A case of mixed cellularity type of Hodgkin's lymphoma was used as a positive control for the EBV LMP-1. The slides were viewed under the light microscope with complete brown membrane and brown granular cytoplasmic staining interpreted as positive for EBV LMP-1, while bluish staining of the cytoplasm and membrane was interpreted as negative for EBV LMP-1. Furthermore, nuclear and paranuclear brown dot staining was interpreted as false positive. Photomicrographs of some of the classical slides were taken, scanned, and presented. Data were presented in simple figures and charts. Out of the 75 cases of NPM recorded during the study period, 35 cases were available for EBV LMP-1 study which composed of 28 cases of NPC, 5 cases of nasopharyngeal non-Hodgkin's lymphoma, and 2 cases of nasopharyngeal adenocarcinoma. The NPC consisted of 14 cases of undifferentiated carcinoma (WHO Type 3), 11 cases of differentiated non-KSCC (WHO Type 2), and 3 cases of KSCC (WHO Type 1). [Figure 1] shows the result of the EBV studies. LMP-I IHC was positive in thirty (86%) of the samples and five (14%) of the cases were negative. According to histological types, all the 14 (100%) cases of undifferentiated carcinoma (WHO Type 3), 2 cases (100%) of adenocarcinoma, and 5 cases (100%) of non-Hodgkin's lymphoma that were studied for EBV were all positive. Seven of 11 (64%) cases of differentiated non-KSCC (WHO Type 2) were EBV positive and 2 of 3 (67%) cases of KSCC (WHO Type 1) were EBV positive. [Figure 2], [Figure 3], [Figure 4], [Figure 5] show representative photomicrographs of histologic types of NPM (H and E) and the EBV LMP-I IHC staining. This study shows that NPC accounted for the majority (80%) of NPM seen in this center and that the undifferentiated type predominates, constituting 50% of NPC. Furthermore, the study shows high EBV positivity (86%) in the tumor cells of patients with NPM; this finding confirms the general trend of NPM and association of EBV with NPC. The association between EBV with NPC has been well documented with studies from Southeast Asia, Israel, Spain, and Italy. However, no previous study has been done in Nigeria to detect EBV in tumor cells of patient with NPC. This study demonstrates that LMP-1 IHC can be used to detect the presence of latent EBV in the tumor cells as 30 (86%) of 35 cases analyzed for EBV LMP-I by IHC were positive. This high detection rate of EBV antigen using EBV LMP-1 immunochemistry shows that EBV LMP-1 is present in high concentration in the cytoplasm of the tumor cells of the patients seen in this study. This contrasts the finding in Israel and some other areas that showed low cellular expression of LMP-1 in NPC., It is documented that the expression of EBV LMP-1 antigen proportionally depends on its cytoplasmic concentration. Therefore, this study tends to support the findings of other studies that EBV LMP-1 IHC could be as reliable as other techniques such as PCR and FISH techniques which have been proved to be sensitive but more expensive. The positivity of all the 14 (100%) cases of undifferentiated carcinoma and most of the cases 7/11 (64%) of differentiated NPC for EBV is in consonance with the reports in the literature and more importantly in the endemic areas where this variant is the most common and mainly associated with EBV. Seven out of 11 (64%) of differentiated nonkeratinizing NPC (Type 2) and 2 out of 3 (67%) of keratinizing NPC (Type 1) were positive for EBV by EBV LMP-1 IHC, respectively. This means that, of the five cases of NPC that were EBV negative, four belong to Type 2 histology while the remaining one is of Type 1 histology. Although there was a tendency for a greater proportion of patients with squamous carcinoma to be EBV negative (Type 1 vs. Type 2, 3, and others), the findings in this study may probably be due to smaller number of cases studied as it is well reported that the Type 1 histology is less associated with EBV. Although the number of cases of NPC seen in this study may be small to determine the statistical significance of the association of Type 1 and Type 2 histology with EBV, the findings of this study show that, even in low incidence area of NPC, EBV seems to be frequently positive. This might be an additional fact to the general view that EBV is almost always positive in areas endemic for NPC, EBV is often positive in intermediate incidence areas, whereas EBV is positive in only a proportion of cases in low incidence areas. As it is well reported that the Type 1 histology is less associated with EBV, the 67% positivity of Type I histology for EBV might be due to small number of cases of NPC in this study or due to presence of less differentiated cells (basal cells) within the tumor or large number of the viral particles within the cytoplasm of the tumor cells. Literature has shown that the nuclear signals of EBER are usually confined to the less differentiated cells (basal cells) and that the KSCC Type 1 tends to carry lower copy numbers of EBV compared with nonkeratinizing carcinomas and this explains the better detection of the virus on in situ hybridization than by EBV-LMP IHC., Moreover, in general, patients with KSCC have lower or negative IgA titers against EBV compared with nonkeratinizing carcinomas. All cases of lymphomas in this study are non-Hodgkin's lymphoma and are all positive for EBV; this is consistent with the fact that EBV can latently infect lymphoid cells causing carcinogenic transformation of these cells. The fact that nasopharyngeal adenocarcinoma is extremely rare is attested to by the finding of only two cases in this study. However, the positivity of the two cases for EBV is not consistent with finding in the literature that there is no association with EBV, but this is in keeping with a report of other studies that detected the virus in all types of NPC exhibiting glandular differentiation. Epstein MA, Achong BG, Barr YM. Virus particles in cultured lymphoblasts from Burkitt's lymphoma. Lancet 1964;1:702-3. Neel HB 3rd, Pearson GR, Taylor WF. Antibodies to Epstein-Barr virus in patients with nasopharyngeal carcinoma and in comparison groups. Ann Otol Rhinol Laryngol 1984;93:477-82. Shotelersuk K, Khorprasert C, Sakdikul S, Pornthanakasem W, Voravud N, Mutirangura A, et al. Epstein-Barr virus DNA in serum/plasma as a tumor marker for nasopharyngeal cancer. Clin Cancer Res 2000;6:1046-51. Smith SS, Fowler LJ, Hausenfluke L, Cho CG, Eagan PA, Gulley ML, et al. Diagnosis of Epstein-Barr virus associated nasopharyngeal carcinoma using fine-needle aspiration biopsy and molecular diagnostics. Diagn Cytopathol 1995;13:155-9. Vaughan TL, Shapiro JA, Burt RD, Swanson GM, Berwick M, Lynch CF, et al. Nasopharyngeal cancer in a low-risk population: Defining risk factors by histological type. Cancer Epidemiol Biomarkers Prev 1996;5:587-93. Raab-Traub N. Epstein-barr virus in the pathogenesis of NPC. Semin Cancer Biol 2002;12:431-41. Young LS, Rickinson AB. Epstein-Barr virus: 40 years on. Nat Rev Cancer 2004;4:757-68. Shanmugaratnam K, Sobin L. Histological typing of upper respiratory tract tumors. In: International Histological Typing of Tumors, No. 19. Geneva, Switzerland: World Health Organization; 1978. p. 32-3. Tsai ST, Jin YT, Su IJ. Expression of EBER1 in primary and metastatic nasopharyngeal carcinoma tissues using in situ hybridization. A correlation with WHO histologic subtypes. Cancer 1996;77:231-6. Batsakis JG, Solomon AR, Rice DH. The pathology of head and neck tumors: Carcinoma of the nasopharynx, part 11. Head Neck Surg 1981;3:511-24. Vinay K, Abul KA, Nelson F, Jon CA. Robins and Cotran Pathologic Basis of Disease. 8th ed. Philadelphia: Saunders, Elsevier Inc.; 2010. p. 750-1. Buell P. The effect of migration on the risk of nasopharyngeal cancer among Chinese. Cancer Res 1974;34:1189-91. Marks JE, Phillips JL, Menck HR. The national cancer data base report on the relationship of race and national origin to the histology of nasopharyngeal carcinoma. Cancer 1998;83:582-8. Jemal A, Bray F, Center MM, Ferlay J, Ward E, Forman D, et al. Global cancer statistics. CA Cancer J Clin 2011;61:69-90. Parkin DM, Whelan SL, Ferlay J, Teppo L, Thomas DB. Cancer incidence in five continents. Int Agency Res Cancer 1997;7:334-7. Alabi BS, Badmos KB, Afolabi OA, Buhari MO, Segun-Busari S. Clinico-pathological pattern of nasopharyngeal carcinoma in Ilorin, Nigeria. Niger J Clin Pract 2010;13:445-8. Nwaorgu OG, Ogunbiyi JO. Nasopharyngeal cancer at the university college hospital Ibadan cancer registry: An update. West Afr J Med 2004;23:135-8. Bar-Sela G, Kuten A, Minkov I, Gov-Ari E, Ben-Izhak O. Prevalence and relevance of EBV latency in nasopharyngeal carcinoma in Israel. J Clin Pathol 2004;57:290-3. Nicholls JM. Nasopharyngeal carcinoma: Classification and histologic appearances. Adv Anat Pathol 1997;4:71-84. Vera-Sempere FJ, Burgos JS, Botella MS, Cordoba J, Gobernado M. Immunohistochemical expression of Epstein-Barr virus-encoded latent membrane protein (LMP-1) in paraffin sections of EBV-associated nasopharyngeal carcinoma in Spanish patients. Eur J Cancer B Oral Oncol 1996;32B: 163-8. Della Torre G, Pilotti S, Donghi R, Pasquini G, Longoni A, Grandi C, et al. Epstein-barr virus genomes in undifferentiated and squamous cell nasopharyngeal carcinomas in Italian patients. Diagn Mol Pathol 1994;3:32-7. Zhang JX, Chen HL, Zong YS, Chan KH, Nicholls J, Middeldorp JM, et al. 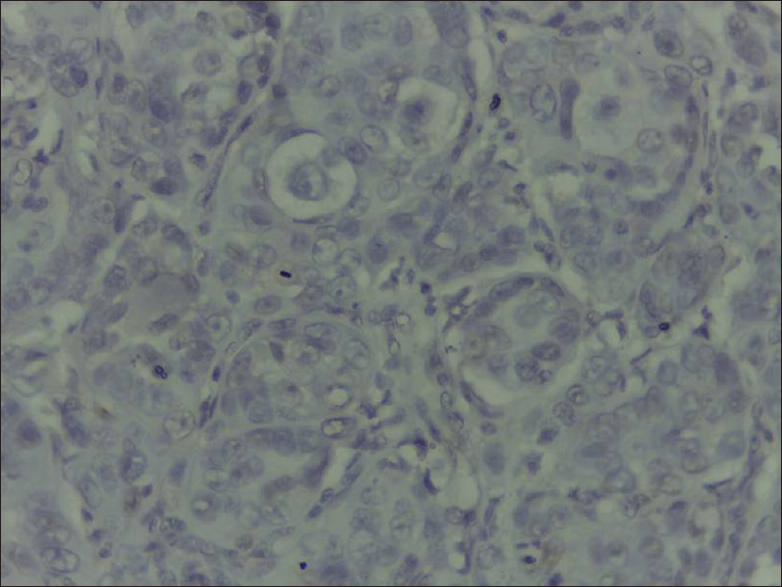 Epstein-Barr virus expression within keratinizing nasopharyngeal carcinoma. J Med Virol 1998;55:227-33. Raab-Traub N, Flynn K, Pearson G, Huang A, Levine P, Lanier A, et al. The differentiated form of nasopharyngeal carcinoma contains Epstein-Barr virus DNA. Int J Cancer 1987;39:25-9.
van Hasselt CA, Ng HK. Papillary adenocarcinoma of the nasopharynx. J Laryngol Otol 1991;105:853-4. Jain D, Parkash V, Li M, Gill J, Crouch J, Howe G, et al. 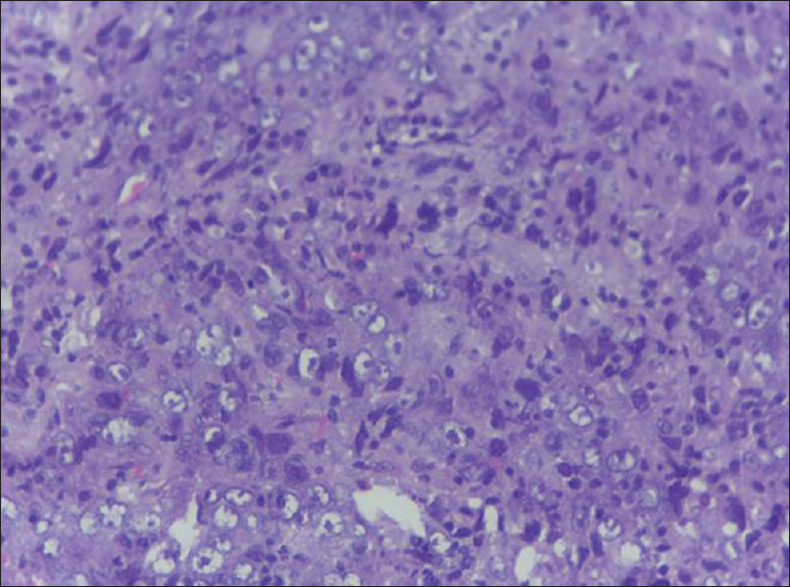 Epstein-Barr virus RNA detection and glandular differentiation in nasopharyngeal carcinoma: Report of 2 cases. Arch Pathol Lab Med 2000;124:1369-72.